I started the Blogger of the Week a few weeks ago and the featured blogger this week is Kiy, read all about her and then go visit her at Rocking Chairs and a Tricycle and Kiy's Recipe Box and say hi! Coffee with coffee creamer, 2 bags of Equal. At least one cup, two if Emi allows. Sunday morning special breakfast: this week it was French toast, blueberries from the farmers market and sausages! Oh books. I love talking books! I fell in love with The Boxcar Children at an early age, also, oddly enough biographies of famous and not-so-famous people during the early days of America. But first and foremost: I had emergency appendix surgery when I was in elementary school (grade 4 or 5 I think). While there my mom brought me a stack of books (I've always been a reader). A new (to me) author that she brought was Phyllis A. Whitney (her books for younger readers). My favorite book, and what started my love for Japan, is Secret of the Samurai Sword . I don't really think I have one. I love and adore art, especially watercolors and pen/ink (which, a hundred years ago were my favorite mediums to work in). I like unknown artists the best, not really into the 'big' names. I like to be surrounded by art and it's important to me to have it in our home. Right now, my favorite is hanging in our family room. 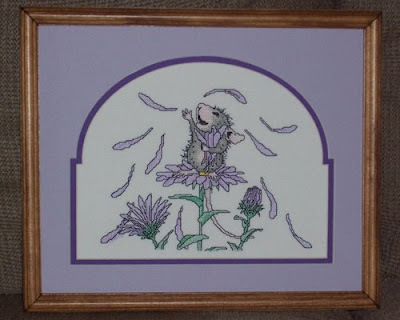 I have no idea who the artist is, my mom and I found this painting at an arts and craft fair in 2001 and both fell in love with it. We both now own this in different sizes and views. I love the colors, the way it makes me feel. The umbrellas and walking along in the park. Feels like a lazy Sunday afternoon to me. Best day/time of day ever. Least fav: cleaning house. Seriously, just about anything else I'd rather do but a full-out cleaning (dusting, vacuuming, decluttering, bathrooms, etc) is something I dread and put off as long as possible. Fav: Is that possible? Then it's not a chore, right? I guess I would have to choose loading the dishwasher. While I really dislike cleaning, I love clean (heh). So just loading the dishwasher and making my kitchen clean and tidy makes me feel like my house is 'mostly clean. I feel the same way about making the beds and putting everything away. You may not be able to eat off the floors but on the surface the house is neat and tidy. Some days (heck, most days!) that's as good as it gets. You know, I’m really not sure. 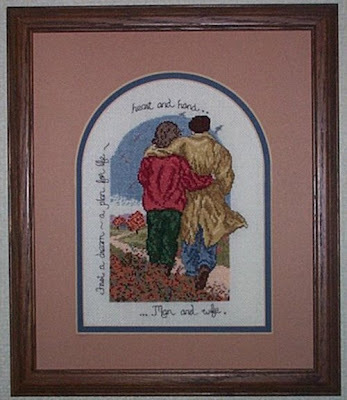 I guess I would have to say all the cross-stitch that I display, both that I’ve done and that were gifts from my mom. I treasure those pieces from her, as I know that each stitch is made with love, the project picked out, the material, the floss (yarns, threads), chosen with me in mind. 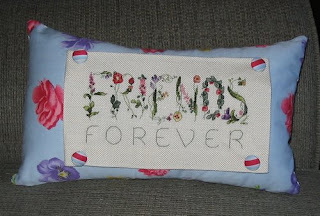 That’s why I also stitch gifts, it brings the person you are stitching for so close. Sometimes for months, depending on the intricacy of the pattern. I try to put something special in every room. Sometimes it’s a stitched piece, sometimes it’s a little figurine, sometimes a tiny flower in a pretty little vase. Something unexpected is so fun! I love and adore color and love to splash that around also. I haven’t done as much in this house as I’ve done in others. I need to find the time (and the energy!) to do more and make it our home. I don’t think I really have an absolute favorite, but this is one I really love. Mainly, as it brings back some wonderful memories. I found this while living in Japan, hanging out on the Cooking Light bulletin board. I made it our first Thanksgiving while living there (yes, with a turkey). We invited all the single sailors we could find for a home cooked Thanksgiving dinner. Many were new to the Navy and very new to being stationed overseas. I know it was hard, being so far from home so we were trying to give them a little taste of home. It was a pretty nice day and a memory I will carry with me forever. Preheat oven to 325°. Clean chicken and remove giblets. This was a seat-of-the-pants kind of recipe on my part where you throw in a little of this, a little of that, splash wine on it and cook it till the juices run clear. After doing it a couple of times, I gathered it took two hours, so that's what I wrote. Obviously, if the chicken is bigger or if someone's oven runs hot or cold, the cooking time is going to vary. Rest assured Anthony Perkins will not be showing up on your doorstep with a butcher knife if you don't adhere exactly to what I wrote. As to the hacking... well, how was your day? Need a little stress reliever? There's your chicken. And if you REALLY want to hack it the way I do, here's how: Glance around furtively to make sure no one is watching, hear the music from the shower scene in your head, cut loose and ham it up. You've done it enough when you start feeling really silly. Or when your husband walks in and starts laughing hysterically. PUH-leeze don't worry about this chicken. (Other than the convection oven part, maybe) It is an extraordinarily forgiving recipe. Now get out there and hack! I think it was when we were living in Virginia. We had a couple of apartments/houses that actually had room to cook. I was working odd times, so had the time to cook and putter. I found that I really loved it, and it helped having a hubby who embraced being my guinea pig. My grandmother was a recipe collector, and I knew that growing up but sadly, it’s not something that we shared together. Later on, we talked a bit about recipes now and again. I now own her entire recipe collection. Someday I want to sit down and really delve into those boxes. A couple of cross-stitch projects, of course. I have done some other things (sewing and painting) but those projects are still packed away in boxes that may get uncovered in the next year, or ten. 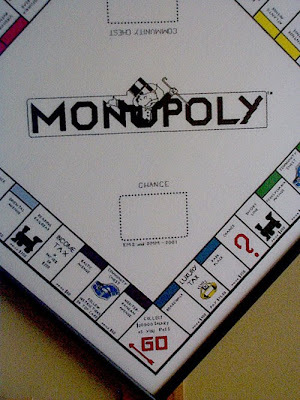 The first is a joint project my mom and I worked on, the game Monopoly. She lives in Michigan and at the time we were still living in Virginia. I was so excited to complete this piece and have it framed. 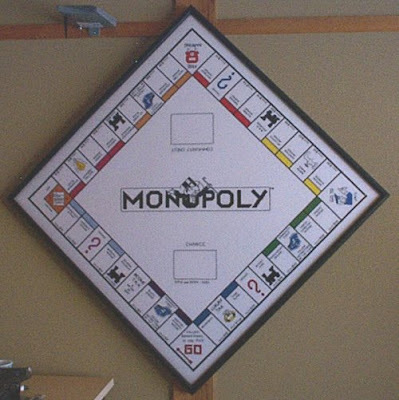 The framer used a kind of Plexiglas so we can actually play it! The next is for my very good friend Mary. I stitched it the year that she and her husband moved from Japan back to the States. That was a hard move for both of us, and it’s been made even harder with the fact that we are living on two different coasts now. We are lucky to see each other once a year and both of us hope to someday, once again, live in the same city. When I choose the project it looked like it would be a quick stitch, and while fun it was not at all quick. It ended up being the most challenging piece I’ve ever stitched and I am quite proud of it. What got you interested in stitching? My mom has stitched for years and years. She tried to get me interested when I was (much) younger, but it didn’t happen. Once I was out on my own, around 1983-84 I started stitching but just small, easy pieces here and there. It wasn’t until I was married that I really embraced stitching and it became a passion. It also became something that my mom and I could share, and we talk about it constantly. We have gone on a couple stitching retreats, shop hopped throughout various states and gone to classes where one or both of us had to fly to get to. We have been to Georgia, Ohio, Oklahoma, Pennsylvania, Tennessee, Kansas, Kentucky, Michigan, New Mexico, Washington, Virginia, Illinois, and Maryland. We are in the planning stages of yet another shop hop (hopping from store to store, visiting, shopping, gabbing, seeing what’s new and fun). We are taking Emi with us … her first cross-stitch adventure! Now that you've read all about Kiy, go on over to her blog and say hi, if you haven't yet! Thanks, I enjoyed learning about KIY! Thanks Barbara, I enjoyed learning more about Kiy!